The Adirondack Park begins 150 miles (241km) north of New York City and covers an area larger than the Grand Canyon and Yellowstone National Parks combined. This 2 million hectare (6 million acre) wilderness is full of natural attractions and historic sites. Thousands of miles of streams and rivers cross the park, attracting canoeists and kayakers, and the hundreds of lakes and glassy ponds are ideal for boating, windsurfing and swimming. There is also good fishing, particularly salmon, trout, and pike, but summer flies can be a nuisance. 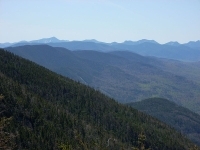 The Adirondack Mountains are among the highest and most dramatic in the eastern United States. In the summer they attract hikers, horse riders, and rock climbers, and in winter there are about nine ski resorts operating. The best ski resort in the region is Whiteface, nine miles (14km) northeast of Lake Placid, which has some challenging skiing and spectacular views, but visitors should be aware of the icy winds which regularly whip up the valley. Lake Placid is a major cross-country skiing destination with 283 miles (455km) of trails and has plenty of other activities including ice skating, tobogganing, and bobsleighing, a must for braver visitors. Some ski lifts remain open in the summer months, ideal for idle mountain bikers. Saranac Lake is a quintessential American small town with a quaint atmosphere and historic buildings, while Ticonderoga is home to a Revolutionary War fort and museum. Elizabethtown and Chester are laidback resort towns, and Old Forge is a good base for exploring the Mohawk Valley and Northern Forest Canoe Trail. We are looking for contributors for our Adirondacks travel guide. If you are a local, a regular traveller to Adirondacks or a travel professional with time to contribute and answer occasional forum questions, please contact us.